Ted Ligety, River Radamus and Steve Nyman talking Olympics at a press conference in Beaver Creek last week (David O. Williams photo). 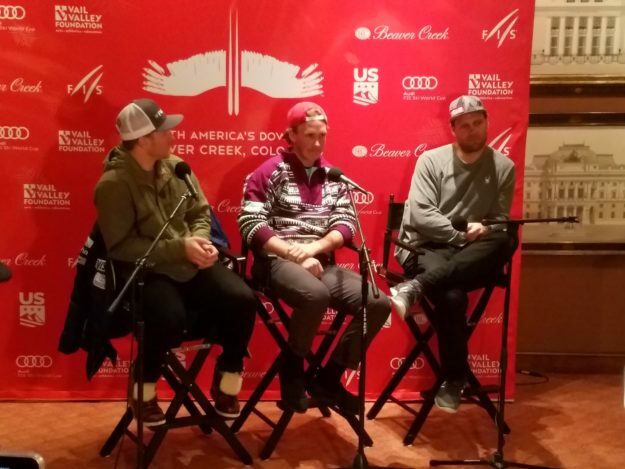 BEAVER CREEK, Colo. — With Reno-Tahoe now out of the running, some of Utah’s most accomplished Olympic athletes feel very confident their state has a strong advantage in its competition with Denver to make a run at the 2030 Winter Games. Park City’s Ted Ligety, the only American man to ever win two Olympic ski-racing gold medals, says Utah still has the well-maintained venues in place from hosting the 2002 Winter Olympics and proximity between its major metro area and its ski areas that Colorado simply can’t match. “Salt Lake is the no-brainer choice really from the sustainability part of it. You see so many places spending tens of billions of dollars on the Olympics and basically everything’s already in place tomorrow in Salt Lake,” Ligety said at a press conference in Beaver Creek during last weekend’s Xfinity Birds of Prey men’s World Cup races. “And Denver offers a big challenge having Vail Pass and all that stuff. It’s hard to get up here on a snow day, where I’ve never in my life had Parleys Summit be closed to get to Park City,” Ligety said of the I-80 climb between Salt Lake and Park City, which takes about 30 minutes. U.S. Olympic Committee (USOC) officials met with the Denver and Colorado Olympic and Paralympic Winter Games Exploratory Committee members in Denver on Nov. 13 to discuss the possibility of Colorado hosting the Winter Games in 2030 or beyond. The visit came just a day after the Reno-Tahoe Winter Games Coalition withdrew the California-Nevada cities from consideration, leaving just Denver and Salt Lake City among the two possible U.S. candidates. “The meeting gave us an opportunity to share our vision for how we could host a world-class, privately funded Winter Games in our state, as well as to share comprehensive operational and financial details that were included in … [the committee’s] final report released this past summer,” Denver exploratory committee chairman Rob Cohen said in a release. The Colorado Springs-based USOC is expected to choose a candidate to offer up to the International Olympic Committee by the end of the year. Another hurdle for Colorado is the committee’s recommendation, despite the private funding promise, that voters should get the final say on hosting the games. A statewide referendum would be held no later than 2020. A no vote by Coloradans over environmental, financial and logistical concerns is what derailed the 1976 Denver Winter Olympics after the IOC already awarded them – the first and only time that’s ever happened in Olympic history. Beaver Creek was conceived as a venue for those games, and now hosts an annual World Cup stop, with races through Sunday. Reno-Tahoe reportedly pulled out of consideration due in part to Los Angeles hosting the 2028 Summer Olympics and therefore holding exclusive marketing rights from 2019 up through 2028. That would leave a compressed two-year window to market the 2030 Winter Olympics, and that shorter window made the games economically unfeasible for Reno-Tahoe, officials said. Utah would appear to be the frontrunner over Colorado from both an infrastructure and logistical standpoint, said one ski industry official who requested anonymity. The IOC adopted the Olympic Agenda 2020 after the $50 billion spent on the 2014 Sochi Winter Olympics scared away many of the bidders for 2022, which ultimately was awarded to Beijing, China – making the 2008 summer host city the first to ever have both winter and summer games. River Radamus, a 20-year-old racer from Edward, Colo., who’s in his first year on the World Cup circuit, said he’d love to compete in an Olympics in his home state, if he’s still racing. Nyman echoed that an Olympics anywhere in the United States would be awesome, although at age 36 he’s pretty sure he won’t be competing. Last year from Vail, retired Olympian Bode Miller predicted California (Reno-Tahoe) would be the USOC’s pick. An NBC commentator for the 2018 Pyeongchang Games, Miller also raised concerns about the stale format of the Olympics and shrinking winters due to climate change. He aded shorter winters are part of the business plan for gear companies like his Bomber Ski brand. Ligety, who like Miller is part owner of a ski gear company, also addressed climate issues impacting the ski industry, especially at lower elevations in the European venues where most of the World Cup is contested. Ligety explained what that looks like for Shred.